This magnificent seaside escape set at the edge of the village of Oia offers exquisite comfort, unique design, a romantic ambience and attentive service. Expansive suites and villas feature sustainable materials that promote natural balance and harmony. Every suite offers a heated Jacuzzi and a private veranda with elegant sunbeds. Themed neighborhoods within the resort celebrate the aesthetic heritage of the Greek islands, while staying true to Santorini’s Cycladic architecture. The hotel features four swimming pools in addition to private swimming pools at the villas. The Revival Spa offers a wide range of treatments and relaxation therapies. 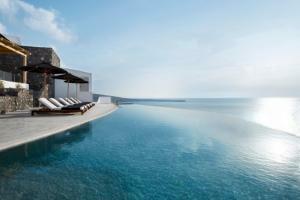 Located on the northwest edge of Santorini, approximately 10 miles from Santorini airport.